Hotel San Francisco is ideal for Business and Tourists for our excellent location in the heart of Historical Centre, Downtown Mexico, half a block away from the Alameda Park Louis Moya no# 11. Have the pleasure to offer the new image of their 140 rooms totally remodeled 4 Star Hotel. The most important quality of San Francisco Hotel is the hospitality. From the first time that you visit the hotel, you feel as if you have been at home.The Hotel San Francisco is located in the heart of Old Mexico City surrounded by 17th Century buildings. The property offers 137 rooms, 3 suites, colour TV, Bar, Restaurant and Room service. 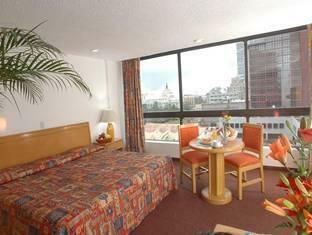 The hotel has a travel agency, car rental and convention facilities. Hotel San Francisco is equipped with ample and comfortable rooms with all the amenities necessary for a delightful stay.Our personalized service will make you feel like at home. We are located in the most convenient quarter of the Centro Historico Mexico city,only a few steps away of the Alameda Central park and the Palacio De Bellas Artes.Our Excellent location will allow you to enjoy the National Folklore, Museum as well as Traditional bars and restaurants.